Nothing says Independence Day than fighting gigantic monsters for gold. 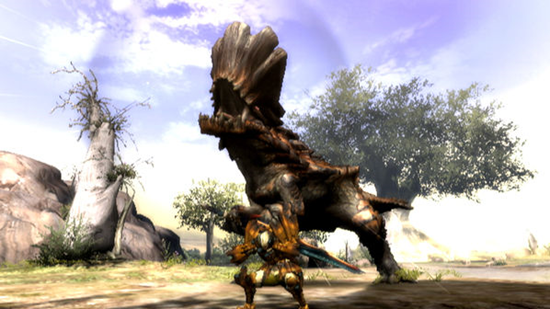 With that Capcom has released a brand new free downloadable quest for Monster Hunter Freedom Unite on the PSP. In this new quest, Triumvirate of Sands, you’ll have three monsters to take on out in the desert – a Daimyo Hermitaur, Tigrex, and Plesioth! Yikes! But it’s well worth it as you stand a chance to make 12300z! If you want to see a video clip of what quest looks like head on over to http://www.capcom-unity.com/ and check out Snow’s blog. To access the quest simply click the "Download" link from the in game menu and you're good to go! There should be a new quest each week for the next couple of months. I hope they release a quest where I can hunt Harry from Harry and the Hendersons. Page created in 0.3038 seconds.